Want to be happy? Give your money away! Scientists at the University of British Columbia have proved that acts of philanthropy can be a short-cut to achieving happiness. Really!! Read the full article. Donate to a tutor/mentor program from the programs listed in the Chicago Programs Links Library and you can help a child, and help yourself. Since late January we've been rebuilding the map capacity on the T/MC web site, so we can follow negative news with map-stories that show where the incident took place, while pointing to neighborhood youth organizations that can grow to be comprehensive tutor/mentor programs, if the local businesses, hospitals, churches in the same area provide the resources for this to happen. Use the Program Locator's Map Gallery to find contact information for programs in the area shown on this map. Just click the map on zip code 60617. Read the Mapping for Justice blog to follow our progress as we start creating new maps like the one shown on this page. Easter is about HOPE. Here's what this means to me. Every faith has high holidays where people come together and celebrate. This is Easter weekend for the millions of people who share the Christian Faith. It's a time for reflection for all of us, not just Christians. What do these religions, and these celebrations mean to us. I think it's all about HOPE. We live in a savage world where there is much suffering. To think that the human animal is superior to other creatures who fight to survive everyday, may be one of the follies that make us different from these other life forms. Some of us have been more blessed by where we were born, who our parents are, and what genes we have. But we all live in the same world, and are affected by the struggles of those who are far different, or far distant, from us. I was raised in the Christian faith and every day I say The Lord's Prayer as a way of giving myself hope and energy to face my day. I think that the middle stanzas of this prayer offer universal hope. To me this request is not a "home run" pitch. I'm not expecting my God to make me rich, or cure my son of a disease, or end hunger or warfare. I'm asking for the ability to deal with these struggles. I'm asking for more energy, more wisdom, a better able to communicate, and just enough money to pay the bills, at Cabrini Connections, Tutor/Mentor Connection, and in my own home and family life. I think this is one of the most important parts of this prayer. I can't tell you the number of times I've criticized myself for a mistake I've made, or something I did not do as well as I wanted to. I think in this part of the prayer God is giving us the power to forgive ourselves. In the movie "The Lion King" there is a scene when the monkey hits the lion over the head and says "It's in the past. Forget it." We need to learn from our mistakes, but not dwell on them, which leads to the second part of this stanza. If we spend time getting revenge, or being angry about what someone else did to offend us, or hurt us, what good does that do? There are too few hours in each day to spend them in this way. If I don't spend time agonizing over my own faults, or the faults of others, I have much more time to work on solving the problems that I can solve with the "daily bread" that I'm given each day. To me this reflects the daily urge to yield to all sorts of things that might get me into trouble. This may be eating the wrong food, spending time on something that is not going to benefit my work, or my family, or doing something that hurts someone else or breaks one of the laws of our land. We all need a little help to avoid the things we do to ourselves. We also need some good fortune to avoid the accidents of life we cannot control. I could walk out of this building today and slip on the ice and be injured or killed. I could live in a part of the world where crazy people are shooting guns and killing each other. Just yesterday a 12-year old Chicago girl was shot in the back by a 15-year old that was aiming at someone else....and missed. Each day I pray to my God that such an accident does not claim me, or someone I love. So how are these prayers answered? As the leader of a small non profit, and parent of a 10-year old and 17-year old, I'm constantly asking God for three things. Give me more time, give me more talent, knowledge and wisdom and help me live longer. With these I can be a better parent, and a better leader. I can do more to help make this a world where God answers the prayers of all who ask for help. I realized recently that my God has been answering me for the past 30 years. I get more time by involving volunteers who use their own time to help me with the work of Cabrini Connections and the Tutor/Mentor Connection. Each year more than 100 volunteers are directly involved, and countless others are indirectly involved. I get more time when my neighbors help me raise my own kids. More than 2000 people have sent contributions to support CC, T/MC since 1993. I get more talent, knowledge and wisdom from the same resources. By unleashing the talent of other people, and the Internet, I expand the wisdom and abilities needed to build the type of programs and non profit support infrastructure that I'm trying to create. We have volunteers helping us in all sorts of ways, from building web sites, creating maps and databases, to hosting workshops at our conferences, or leading sessions at our tutor/mentor program. We have the potential of being joined by millions of others as we focus attention through our web sites and our maps on all of the places in Chicago and other cities where people were born into poverty or have fallen into distressed situations. I live longer by sharing my ideas with others who adopt them in their own work. I use a variety of web sites (see links at left) to share my thinking with thousands of people who visit my sites every month. I can live forever through these ideas and the way people keep them alive in their own actions and in places throughout the world. Maybe this is one reason so many people are sharing their own ideas on the Internet. With so much information, I think what gets used, and what gets remembered will be that which helps those who are disadvantaged, and that which helps solve some of the complex problems that face our planet. I have not become rich through the work I do, and Cabrini Connections, Tutor/Mentor Connection has been short of money many times over the past 15 years. Yet, when everything has seemed hopeless, there has always been some company, foundation and/or donor who have stepped forward with just enough money to help us weather that storm and continue our work. To me this is the HOPE that keeps me going everyday. It's what I'll be thinking about as we move through this holiday weekend. I hope you can unleash this HOPE in your own lives and community services. Stop the Violence around Crane. Is Police State Mentality the Answer? Today and yesterday the Chicago SunTimes featured two-page stories in response to the shooting of one student near Crane High School, and the severe beatings of two others. You can read 3/17 here and 3/18 here. These stories focus on the immediate response of setting up police escorts to get kids from one public housing area to the school, because the kids fear retaliation from kids who come from the neighborhood of the youth who was killed. That's a good show of force by our new Police chief. But it's not enough. Last week an article in the SunTimes focused on the new book chosen by the Mayor and the Public Library that everyone in Chicago is hoped will read. Why couldn't the choice have been the articles in the Tutor/Mentor Connection web library? Maybe if more people read these we can begin to get more people involved in solving the problems that plague our inner city neighborhoods. I'm sure the stories about Crane High School are selling newspapers. But, why aren't the editorial and education writers doing stories about how kids who fear for their lives aren't going to be focusing on learning and how this affects the future of Chicago's economy because we're leaving too many kids behind who we need to fill positions in the 21st century workforce? Why aren't we asking John, Hillary, and Barack what they are doing to engage people in this type of complex problem solving? Over the weekend I browsed a publication in my library, titled "Wanted: Solutions for America. What We Know Works. An overview of research about what works (and what doesn't) in social service programs." This was published by the Pew Partnership for Civic Change in 2003. In the conclusion the article reads "Equipped with reliable information about what works, how do communities move forward to tackle tough problems? If so much is known about promising approaches, why haven't we come farther faster in connecting all citizens to hope and opportunity." As the authors of this report conclude, "Change doesn't just happen. It demands gifted and persistent leadership." There are no short term answers to this. Putting an army of police around this school won't solve this problem. It's a band aid. And it won't address the same problem in the area around many other big city public schools. 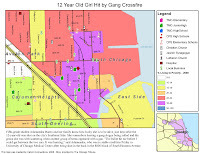 In many of my blog articles I use maps to illustrate the wide geographic areas where poverty is concentrated in Chicago, and where there are poor schools, gangs and youth on youth violence. 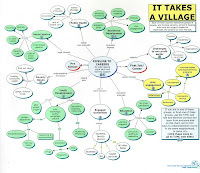 I use graphics and concept maps to illustrate what the Pew Partnership was referring to when they said "We have focused too narrowly on specific interventions without confronting the complex interrelationship of issues in a community." In the links map of the Tutor/Mentor Connection library I illustrate the four components of the T/MC library, in an effort to draw together people from different silos, and in an effort to expand the thinking and problem solving ability of people who focus too narrowly on just one part of this problem. Why mentoring? Because mentoring is an adult form of service learning. It can engage adults who don't live in poverty directly in the lives of youth who do. If we can support the growth of hundreds of volunteer based programs around the city we can grow the number of adults who begin to understand this problem, and begin to use their time, talent, networks and wealth to contribute to solutions. I host a May and November conference with a goal of drawing people who read or write these articles and host these web sites, into face to face networking, and to create public awareness that draws more people to the Internet where they can read these articles and connect with others. If you're in health care, law, higher education, engineering, workforce development, or if you're a leader, or volunteer, or donor who support tutoring/mentoring programs, I encourage you to use the conference as a meeting place and the T/MC library as a resource for complex problem solving. If you're the new head of the Chicago Police Department, I encourage you to look at the T/MC as your own strategy. There's no way you can keep an army of police around every high school in Chicago, throughout every school year. The SunTimes articles show that the problems of gangs have plagued Chicago schools for 20 years and more. It's almost taken for granted. Why? Student Song Calls for Change Following School Shooting. "Check out a few of my students from Phoenix Military Academy on the news!!! David Woulard is such an amazing kid. He wrote this song this past weekend after a Crane HS student was shot and killed 2 blocks from my school. I asked David the other day after school in the computer lab if he knew any Keane songs and he said, "Is Everybody's Changing ok Ms. Mackey?". He played the whole song and nearly had me in tears. That song is one of my favorites and I didn't think he'd actually know it. If any of you out there have any contacts in the music world, let me know!! Check out this website to read the ABC 7 Chicago story and listen to his song... "
I hope you'll all take a look. 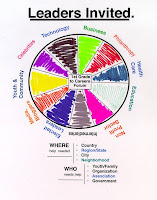 I encourage you to visit the Tutor/Mentor Connection Map Gallery which has been completely rebuilt by Jim Cory, a volunteer based in Madison, Wisconsin, who I met several years ago in an internet discussion hosted by the World Bank. Jim's long-term involvement illustrates the way volunteers can use their talent to help non profits with important work. It also illustrates that volunteers don't need to be in your own neighborhood, to help. We'll be updating all of the maps in the Map Gallery and adding new maps, thanks to work being done in our office by Mike Traken, a GIS intern. You can follow Mike's progress on the http://mappingforjustice.blogspot.com blog. Read previous articles on maps and leadership to see how we hope these maps are used to build a better distribution of high quality tutor/mentor programs in all poverty neighborhoods of big cities like Chicago. In Chicago we're mourning the killing of another student. People are calling for gun control laws (which I support) and I've heard some say they will put up a $5,000 reward to catch anyone who kills a youth in the future. I wish the city leaders would spend some time looking at the availability of non-school tutoring, mentoring, learning, enrichment and jobs programs in the 60612 zip code where Crane High School is located (which is where the most recent shooting took place). Then develop a T/MC type strategy aimed at helping the existing programs constantly improve, while helping new programs form in under served areas. On the Program Locator section of the T/MC site, I only see three organizations offering any kind of tutoring and/or mentoring during the non-school hours to teens in this zip code. If there are more, we don't have these programs in our database. One of the challenges we face, as a small non profit organization, is reaching out to all of the organizations in the Chicago region who do any type of volunteer-based tutoring and/or mentoring to teach them to list their organizations in the Program Locator, and to keep the information current. Another problem is finding the talent and technology support to keep our web services working and easy to access. However, the biggest challenge is a lack of advertising dollars to reach out daily to all of the people who want to see schools improve, poverty reduced, violence end, and youth more prepared for jobs and careers. This map illustrates the many different interest groups who need to be connected to this community-wide problem. Without advertising and public relations dollars, too few people find the information we maintain in the Tutor/Mentor Library, or the directory of tutor/mentor programs we host. Thus, we're innovating new ways to build public awareness, and this is by blog exchanges. Click here, here and here to see three places where tutoring/mentoring is the subject of bloggers around the country. If you'd like to connect with us, in this blog exchange strategy, we'd like to hear from you. It's one way we can increase public attention for all of us. Tutors or mentors can make a powerful difference in a child’s life. They prepare children to reach beyond immediate circumstances. They push children to transcend societal and personal limitations. And assure children that somebody besides those in their household cares for their welfare. The results, as anyone who has done it knows, can change lives, both the child’s and the tutor’s or mentor’s. Public school classes are too large for a teacher to interact with children individually. Parents or guardians may not have the time, the expertise or the patience necessary to affect or supplement a student’s progress. This explains why tutors and mentors are so vital – tutors and mentors provide undivided attention that can bring about academic or athletic or social growth in a young person, which might otherwise be unattainable or neglected. Tutoring and mentoring positively affirms a child’s feelings of self-worth so they develop as individuals and as human beings, and more effectively achieve their full potential as learners. I started participating in a tutoring program during my junior year of high school. Every other week, for 90 minutes, I met with a sixth grader from an impoverished area of Philadelphia. The children were brought by bus to my suburban school. I vividly recall the first child I tutored, Matthew. He could barely read, even simple words were difficult for him, and Matthew’s struggle to read affected his self-esteem. I remember how much he wanted to learn, and how much I wanted him to succeed. Matthew didn’t have someone at home to help him, but he had something else – desire, and as the weeks turned to months, his ability to read slowly, slowly improved. And so did his confidence. By May, although he was still behind many of his peers, the gap had indeed narrowed. In recognition of his progress, I gave Matthew a couple of books about sports to read over the summer. His ear-to-ear smile has never faded from my memory. Decades later, I am still involved in tutoring and mentoring as a member of board of Lawyers Lend-A-Hand to Youth, a project originally created by the Chicago Bar Association and now an independent not-for-profit organization. Lend-A-Hand to Youth provides guidance, encouragement and support to mentoring and tutoring groups who serve young people in at-risk local communities. We also recruit lawyers to volunteer as tutors and mentors, recognize outstanding programs and participants, and award grants to exceptional programs. We lend more than a hand; we restore hope, and opportunity to economically disadvantaged youth across the Chicago area. In at-risk communities, parents do what they can for their children but must deal with their own personal quandaries. Tutors and mentors offer a gleam of light for a better future. While tutoring and mentoring cannot erase poverty, crime, or violence, or put an end to neglect, abuse, or irresponsible parenting, it can make a world of difference for a child. To paraphrase the anthropologist Margaret Mead, never doubt that thoughtful, committed tutoring or mentoring can change the world of a child. Indeed, it always has. I am sure that Matthew would agree! Thank you Judge Hyman and Lawyers Lend A Hand Program for supporting volunteer based tutoring/mentoring in Chicagoland. Dan Bassill is a guest blogger today in The College Puzzle blog. I'd like to encourage you to review a white paper I received this week from the UCLA Center for Mental Health in Schools, titled "Frameworks for Systemic Transformation of Student and Learning Supports"
In the preface the authors write "if school improvement efforts are to be effective in enabling all students to have equal opportunity to succeed at school, we all must move significantly beyond prevailing thinking. Current policy (NCLB) and practice is a grossly inadequate response to the many complex factors that interfere with positive development, learning,and teaching." Basically they say that "teaching to the test and the federal No Child Left Behind" strategy is a flawed policy because it does not give equal weight to the social emotional and extra learning needs of children, especially those in high poverty areas. I agree. I wonder what our presidential candidates think about this. The UCLA group is in the process of building a community of people who are interested in their work, and who begin to use it to support their own actions in many cities and states. With enough support communities around the country might begin to implement these ideas, and public policy, and funding, might support such a strategy. Building such support is a difficult process. I'm not sure it can be achieved without expanding the base to include workforce development goals of businesses, hospitals and universities. The UCLA plan is a school-centered strategy, with a community based component. I approach this challenge from a child and community centered perspective, where the school is one of the stakeholders, but not the automatic leader. The child is the center of this universe and we're all part of the "village" of people working to help that child to a career. I feel that volunteer-based tutoring/mentoring is a way to expand the range of people involved in helping kids grow up. If workplace volunteers are targeted, this is also a way to build business involvement in education goals. The May and November conference, and the Tutor/Mentor Connection web site, offer meeting places, and a library of ideas, for anyone who wants to expand their knowledge and become more strategic in how they use their time, talent and/or dollars to help inner city kids succeed in school, and in life. I hope that you'll read the UCLA paper and add the T/MC ideas to this strategy and that you'll connect with us in one of these forums. Share A Meal on March 11. Make a Difference. Making a difference is a simple as lifting a fork. On Tuesday, March 11, 2008, restaurants across Illinois join with generous dinners to raise money for non profits in the 5th Annual Share-A-Meal with Community Shares of Illinois. Cabrini Connections, Tutor/Mentor Connection is a member of Community Shares (under the Tutor/Mentor Connection name). So you can enjoy a great meal, have fun with friends, and help us raise money for the work we all do. Each restaurant will donate 20 to 30% of the proceeds of each meal purchased on March 11, and this support over 80 non profits in Illinois. Please visit http://www.share-a-meal.org to see the list of participating restaurants and non profit members of Community Shares of Illinois. Just Why do Students Drop Out? I encourage you to read this article based on research being done by a group at Arizona State University. The research shows that the decision to drop out of school is a long-term process, starting as early as first grade. This means solutions need to be much more comprehensive than what we're doing now. It also illustrates the importance of a comprehensive volunteer-based tutor/mentor strategy.